Last night myself and Adam had another game of General Bonaparte meets Chain of Command. This is the first time that I have commanded the French for quite sometime and the first ever with this rule set. 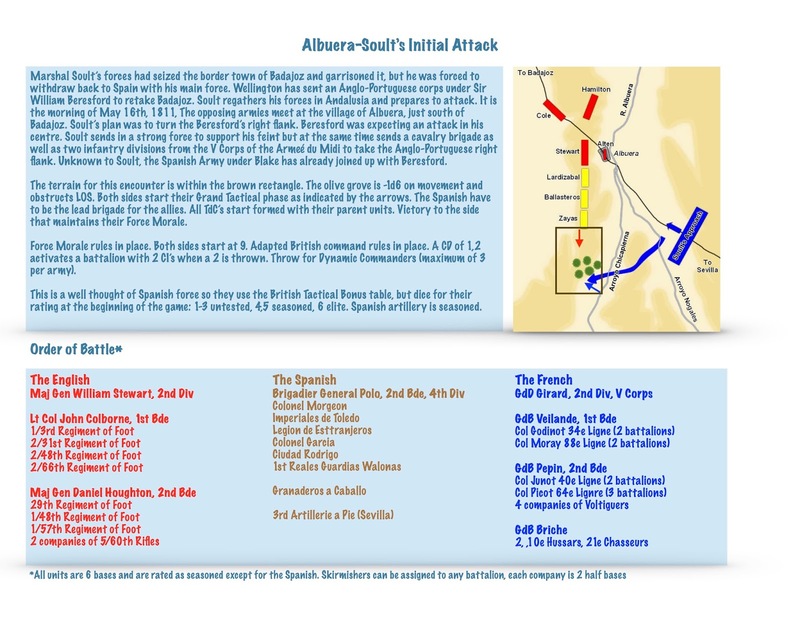 As you can see above we played an historical encounter based on the opening French attack in the Battle of Albuera. We did not get to a conclusion, but I believe the French given time would have won the game. 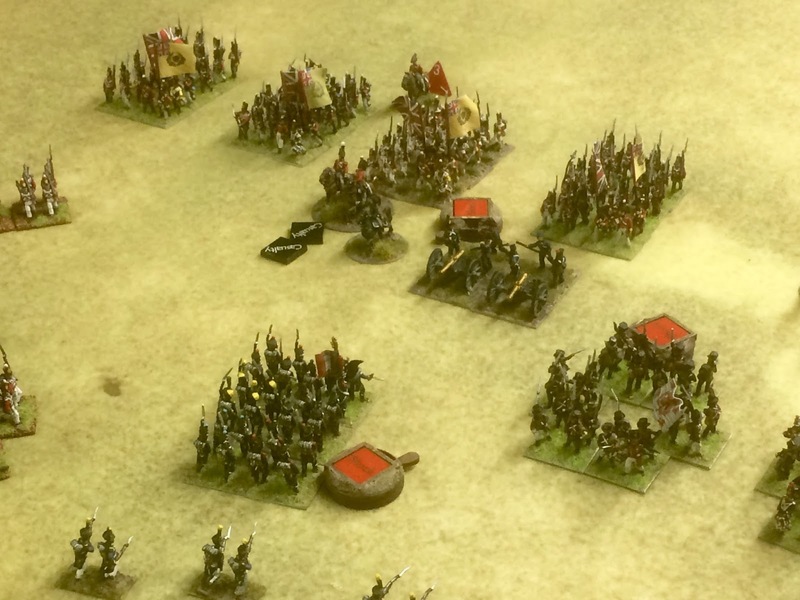 GB CoC has a patrol phase, not particularly exciting but it did bring the troops within 18" of each other. Force Morale 10 for the French and 8 for the Allies, both starting from 9. 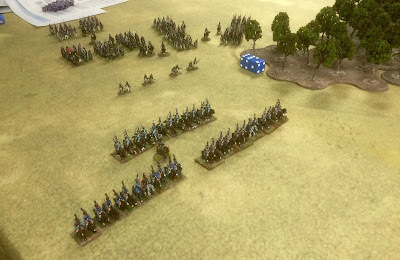 The French can set up on the right behind a imaginary line that connects the markers. Likewise for the allies. 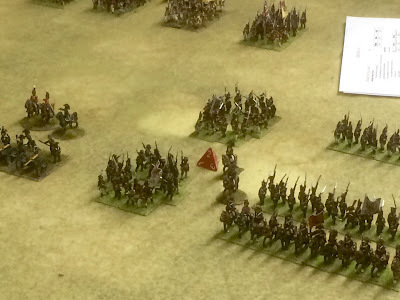 My plan was to soften up the Allies with a cavalry attack followed by infantry. And although I was the attacker and had first move, the initial throw of my command dice was quite poor and I could activate only 2 units! Not a real accurate position especially for the British in line. I believe I will change the scenario so the British have to place their troops in march column at the beginning of the game, as well as being at least 12" behind the Spanish front lines. 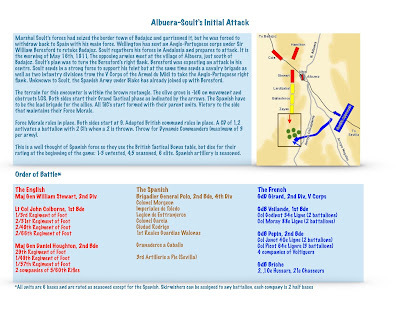 The scenario is trying to duplicate that when the French attack was noted by the British, it was only the Spanish that stood between them and Allied right flank. Then an attempt to break a British square. I did not take a lot of photos as the action quite quite heated. The allies moved into square in the initial part of the game, which made it tough as the French had no cannon. Fortunately most Spanish units when encountered came up as untested, except for the Cavalry which came up elite. 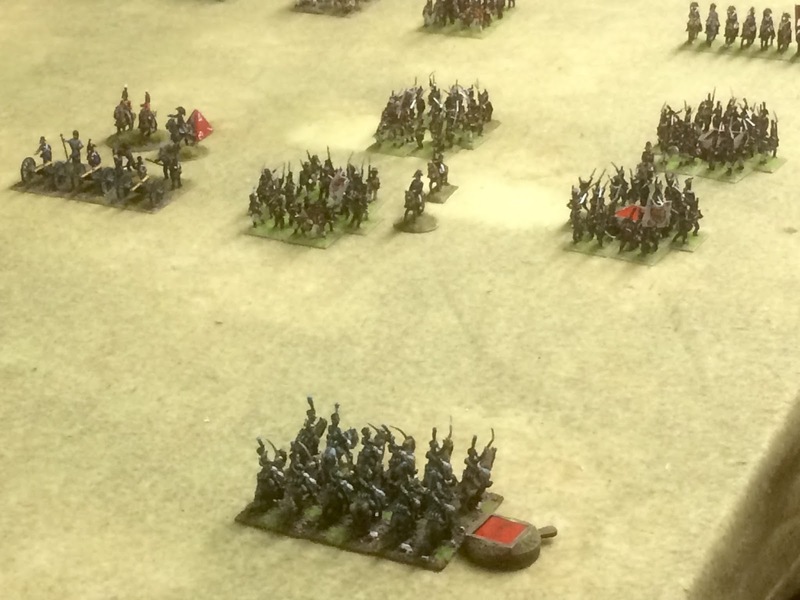 They were not able to stand though, in a French cavalry assault they were thrown back, not to re-enter the game. 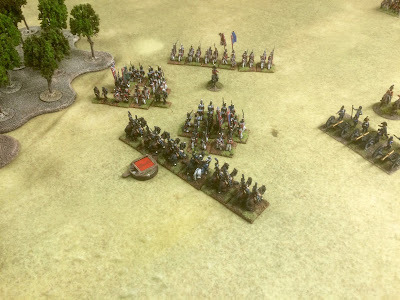 The French made a few goes at attacking squares and were able to weaken them and I believe may have broken one. 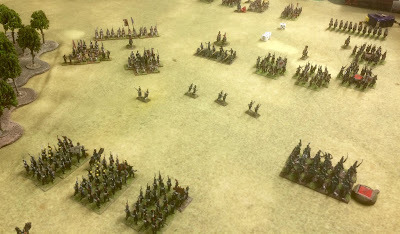 But they were eventually thrown back, and I then threw in the French Attack columns. These had some success and through some luck dice and were able to give the Spanish cannon some trouble. Especially troublesome for the Allies was that Major-General Stewart was wounded in the assault and lost 2 command initiatives. The game then went into a bit of a slog without the best command dice on either side. Lots of combat though with multiple fire fights. I believe there were 4 broken allied units and 3 broken French units by game's end. The highlight for the French was attacking the Spanish guns in attack column and getting away with it. The Interruption with a special 5 dice was what made it possible. 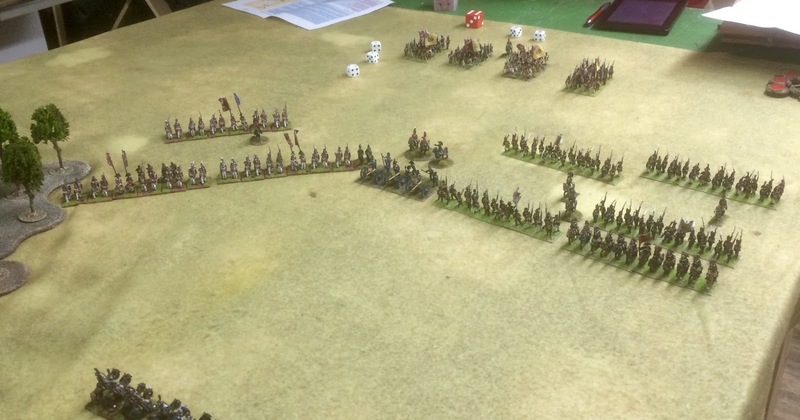 Near the end of the game I made multiple cavalry charges as time was running out, but my movement dice failed me, one charge ended up 1/2" short. It was unfortunate as their were multiple almost broken British units as well as untested Spanish units that I just could not get to in time. By now 4 hours had gone by and we had to call it a day. I had one whole brigade that never even became engaged. It was a good game, and I really liked the OB, it made for a very interesting game. We got to play test many mechanisms that we had not previously encountered. I have raised several questions on the yahoo group especially about squares. I do not think I would change much in the scenario aside from restricting the British initial dispositions. Adam felt the olive grove maybe should not have taken up half the board, but I am not so sure. When I look back at the game, I see that I made a pretty basic strategic error that if corrected could have won me the game. Can you see it? Look at the photos with the French and Allied first positions. Attacking cannon in Column, very tricky! 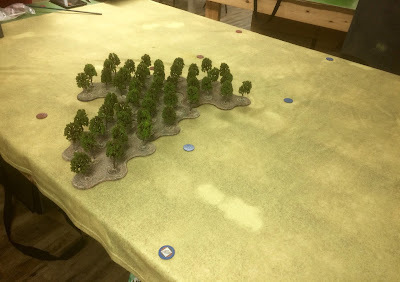 nice to see you get your new troops out on the table!